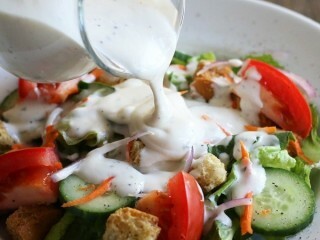 It is true that ranch dressing was invented at Hidden Valley Ranch near Santa Barbara, California, by a real salad-wranglin' rancher. In the 50s and 60s Steve Henson and his wife, Gayle, shared their 120-acre dude ranch with University of California at Santa Barbara students and other festive partiers for rousing weekend shindigs. The dozens of guests were served steak dinners and delicious salads topped with Steve's special blend of herbs, spices, mayonnaise, and buttermilk. As word got out about the fabulous dressing, more guests were showing up at the ranch and walking home with complimentary take-home jars filled with the stuff. Eventually Steve figured he could make a little cash on the side by packaging the dressing as a dry mix and selling it through the mail. At first he was filling envelopes himself, but within a few months Steve had to hire twelve more people to help with the packaging. Soon Steve had a multi-million dollar business on his hands with a product that for ten years he had been giving away for free.